Rikomagic had launched the MK802III Remote Client, which is meant for users of the Rikomagic mini computers, and to use your other Android phone or tablet as a remote control for one of these little sticks while it’s plugged into your TV. This is also applicable for those who load up Finless ROMs on their MK808 or similar devices. To put it simply, you don’t need an alternate controller device, like a mouse or keyboard to control your MK802/MK808 Android Mini computer sticks, you could now just use your Android device, such as a phone or tablet as a touchscreen controller through the MK802III remote client application. 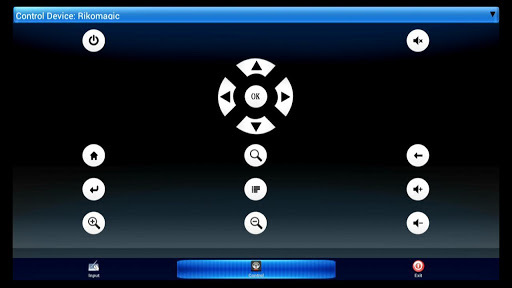 Alternatively, if this doesn’t work for you and you are using XBMC as a launcher replacement, you can also use a number of remotes such as the webserver remote, or the many other XBMC remote alternative applications. Back to the MK802III remote client, this is a good addition to the range of Mini PC devices. It was built for the MK802, but is also working with the MK808 series, FINLESS ROM loaded (tried and verified) and also reported to be working with the RK3188 or MK908 type of mini PCs. I will try it out soon once I receive my pending shipment MK908. The same wireless network would need to be connected by all the devices, and once that’s that, it works pretty well. The first time you fire up the app it will scan your network looking for a compatible device. Just choose your device from the list. If your phone/tablet fails to search any server devices, you can connect your TV/server manually by entering an IP address. From there you can use your Android device as a pseudo-mouse or like a touchpad to control your mini PC. You can also bring up a keyboard to start typing, or turn your phone into a touchscreen controller — allowing you to pinch to zoom, scroll through websites, or even play games on your TV. Beyond the basic controls, there’s also the ability to emulate the GSensor and transfer the gravity sensor or motion sensor data to the MK802 / MK808 device. For e.g. playing a racing game. There’s Voice Control, which allows you to control your TV via your voice. The voice commands are limited. Google Voice Search app is needed, or voice-to-text input.